Confused reading the title?? Well, allow moi to explain :D This is actually adapted from the recipe for eggless no-bake mango cheese cake by Nags on Edible Garden. While I have used slightly different ingredients, the method is exactly the same except that I did not use any gelatin as required by her recipe. Gelatin is what makes this set and form a cake but I thought I will avoid it (anyways I did not have any in my pantry!) and see what it turns out to be. After having this, my brother told me this is not a cake it is a custard. Hence, the name (thanks bro!). The addition of fresh mango brings such a refreshing taste to this dessert; not to mention the lovely, seductive yellow colour! Three things attracted me to this recipe (other than Nags' tempting clicks); one: the fact that it is eggless; two: it does not require baking which greatly simplifies matters for me (I am pretty pathetic at baking cakes); and three: I liked the idea of serving them in individual glasses which makes it easier to serve and is more presentable. You may want to add gelatin if you are looking for a cheese cake or you can avoid it and end up with a different dessert but with the same delicious flavours! Crumble the digestive biscuits till they are free from lumps. You can use a rolling pin or pestle or a hand processor for this. Mix in the soft butter and then add a layer of this to each serving glass. Press it firmly with the back of your hand or a spoon. Leave it in the fridge while you prepare the cream cheese filling. Blend cream cheese, cream and sugar till it is smooth. Add half of the mango puree to this mixture and combine gently. Take out the serving glasses from the fridge. Pour a generous layer of the cream cheese mixture on top of the digestive biscuits. 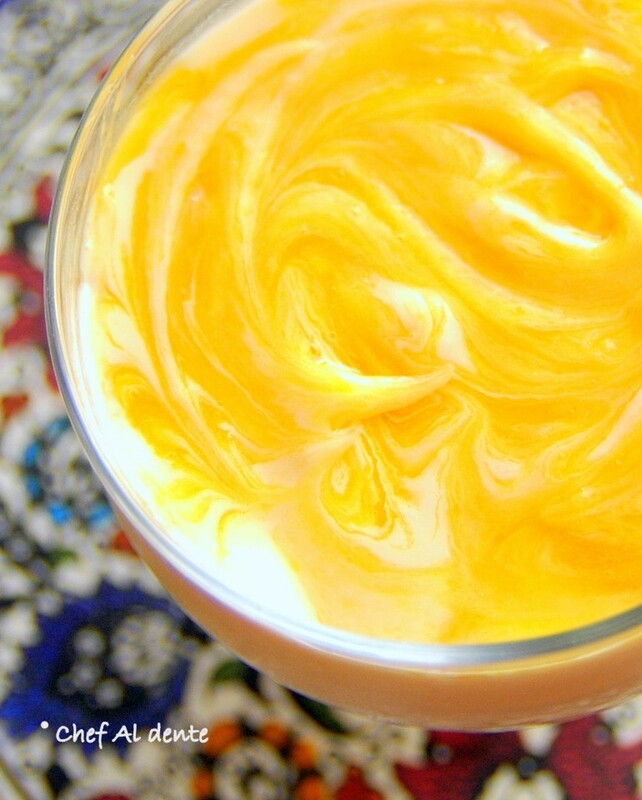 Then add about a tablespoon of the remaining mango puree to each glass, on top of the cream cheese layer. Swirl it with the tip of a spoon till you get nice rippled patterns. Cover each glass with a plastic cling film and refrigerate from 8 to 10 hours. Serve chilled. Me me me me dont forget me. Looks totally delicious, very, very tempting..
Oh yum! I love anything mango. 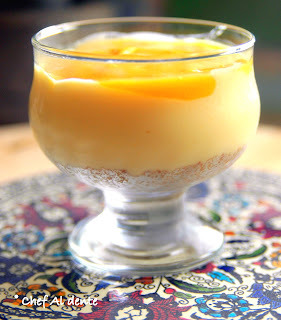 This sounds like such a creative mix of ingredients (unless it's standard for a custard, I have never made one before) I'm hungry all over again! This is something my friend will like as he is a egg-less freak.